The construction boom is nowhere more apparent than the Harwood District near Uptown, with more than 3 million square feet of class-A office, residential and retail space within a campus/park-like setting. 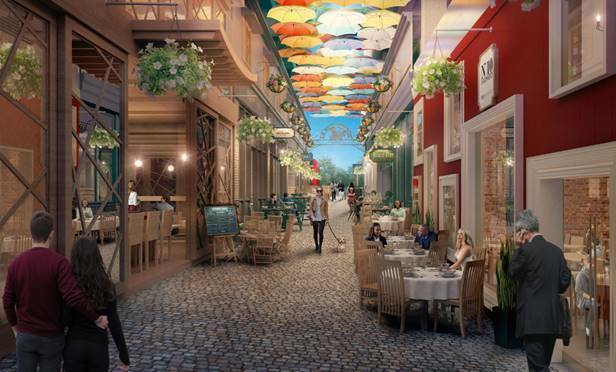 La Rue Perdue is a cobblestone alleyway consisting of six to seven restaurant and retail spaces. DALLAS—Increased population growth of the 20-to-34-year-old worker and strong net migration lure companies and drive expansions in Dallas/Fort Worth. The region continues to lead the nation’s major metros in absolute job growth, a large chunk of which includes traditional ofﬁce-using positions, according to a report by Marcus & Millichap.